There’s still time to register for Steel Wheels in Sacramento, your chance to meet and question railroad officials and advocates and to learn about the state of the passenger rail state here in California. 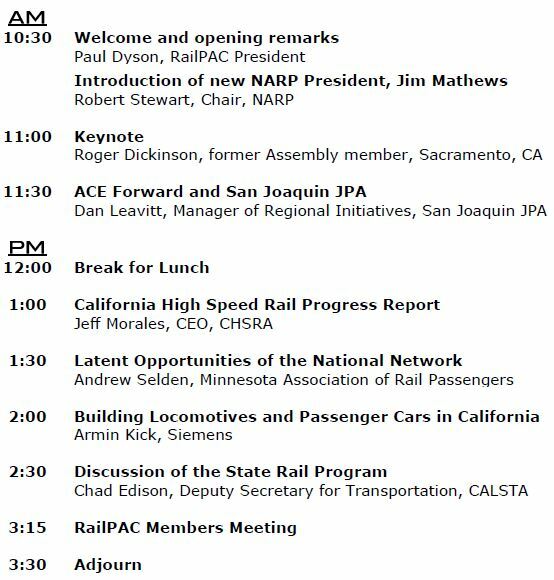 I have been told that Jeff Morales, CEO of CHSRA will be the presenter for High Speed Rail, and Chad Edison, Deputy Secretary for Rail of California DoT will update us on the state intercity rail program and passenger rail in general. These are the top two state officials for passenger rail. In addition this is your chance to meet the new NARP President, Jim Mathews, who is coming from Washington DC for this meeting. This is a not-to-be-missed event. Take advantage of the 15% Amtrak discount on travel to Sacramento and bring a friend. See you there!